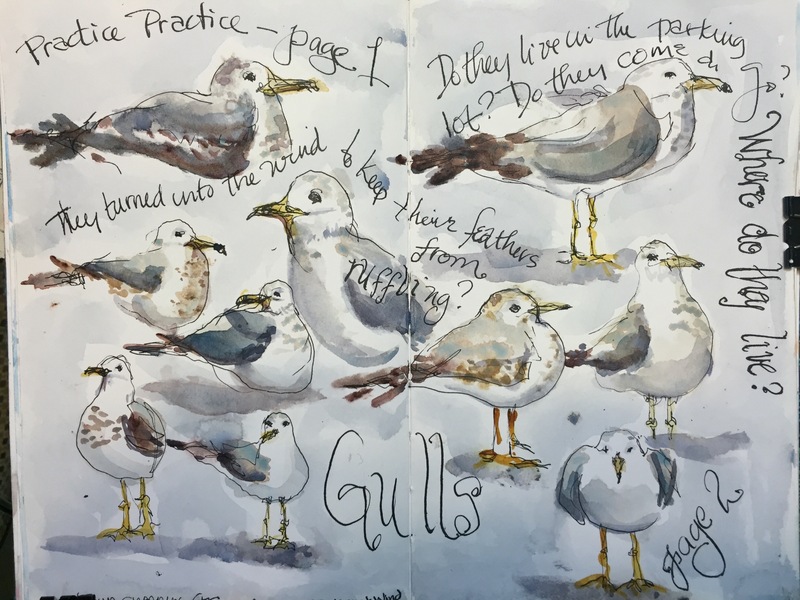 The gulls were in the Target Evans parking lot when I drew them. I did paint them at home. Thinking about writting 50 shades of grey on this one because I have made that many shades of grey today. No matter how light it was the gouache always dried darker. Hmm. Grey is made from schminke indigo Quin Violet and English red a sort of burnt sienna. I did use some cad yellow and white. A lot of white!!! Background is cad yellow and turquoise. There’s only one bird I don’t like after two plus hours of painting. ﻿his bill is kind of yellow green. 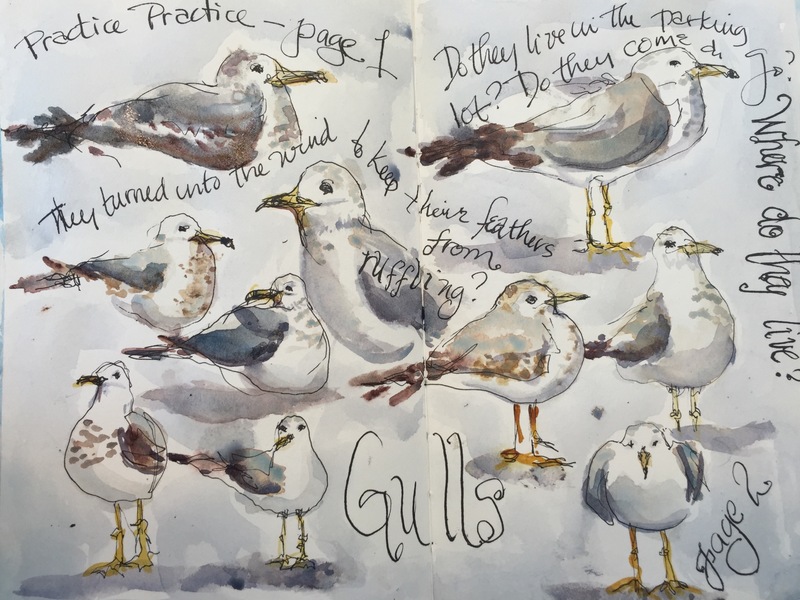 I still have one more page of gulls to draw. I think he’s my favorite. I would get too. Why is 222 days of consecutive blogging more impressive than 221?! I was in pursuit of more birds today. Looking for some geese but couldn’t find any near the edge of water. All were swimming out in the middle of any pond. Too far to see. Then I remembered the seagulls we drove through yesterday. I stopped and sure enough they were still in their parking lot. I started drawing. They tried to stay away. I remembered I had a couple of biscuits from Cracker Barrel in my purse. They got nearer and nearer as I threw bits to them. Hard to sketch hold the book and throw them snacks. But I managed 8 pages. Colors Piemonite mixed with cerulean and ultramarine. Greys are Quin Sienna and cerulean as well as burnt umber and ultramarine blue for darks and black. Background is a very watery piemonite and cobalt. I really should slap an envelope over the bird on the right because I think the two on the right are super. Same colors as above just not as much water in background. Beaks and legs are Quin gold and nickel Azo with Quin Sienna. I have gotten bored with cerulean backgrounds. 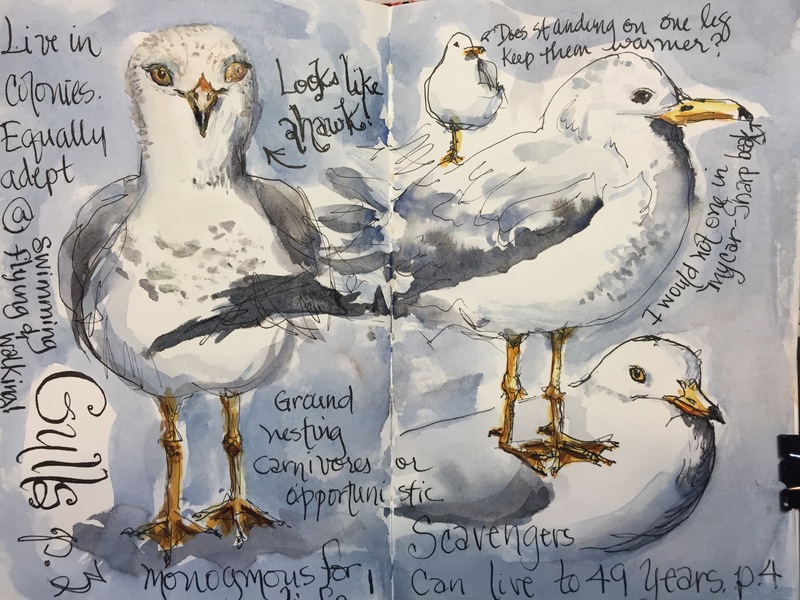 Wait til you see the backgrounds I am planning for tomorrow’s gulls. I think I will feed then crackers. Trying to go gluten free.